The most complete training to practice and improve your daily mathematics. Solve sums in your head. Track your progress. Become better and faster. 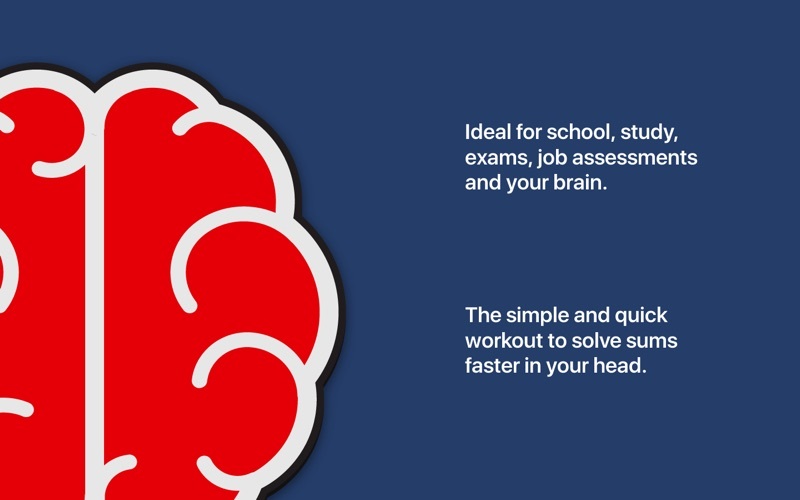 Ideal for school, study, exams, job assessments and your brain. "It really helped me with mental math in everyday life." 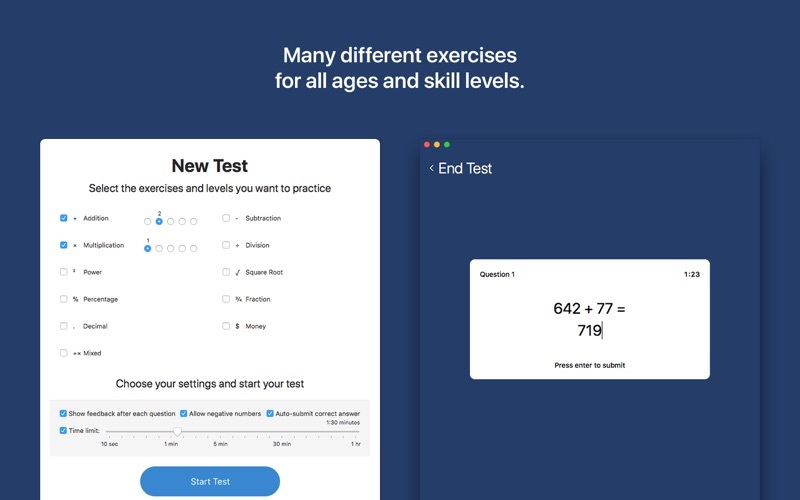 "A really fun app for giving your brain a quick math workout and very simple to use!" "This app is worth every cent!" Mental Math is suitable for everyone. For all ages and educational levels. Just pick exercises, a difficulty level and start solving. There is an unlimited supply of questions. You can stop at any time, or use the timer to challenge yourself. 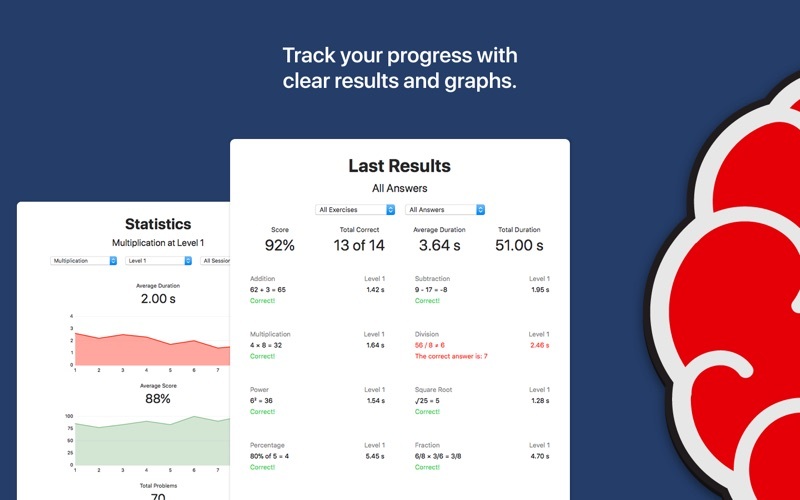 Get instant feedback on your answers or check your results at the end. Extend your arithmetic skills in addition, subtraction, multiplication and division with powers, square roots, percentages, fractions, decimals, money and mixed operations. The large variety of exercises will give you a complete workout and will prepare you well to solve any daily math problem in your mind. Keep improving by progressing through five difficulty levels. The sums will become more challenging to solve, so you can work towards your desired level of competence. You can specify your preferred difficulty level per exercise type. 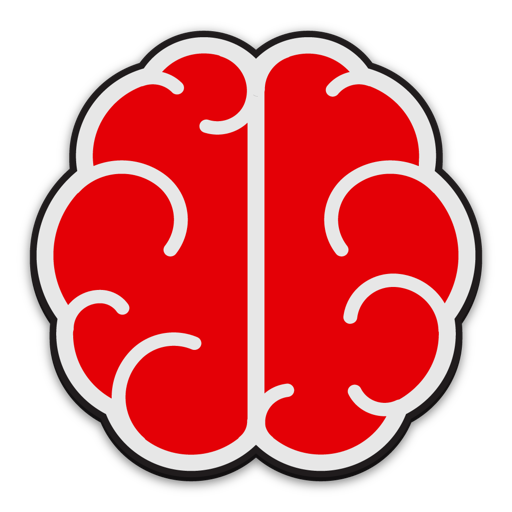 The different levels make Mental Math suitable for children, teenagers, students and professionals at all educational levels. Export your results in spreadsheet format. This enables you to use and analyze your data in any way you want. You can practice unlimited sums in addition, subtraction, multiplication and division at the first difficulty level for free. 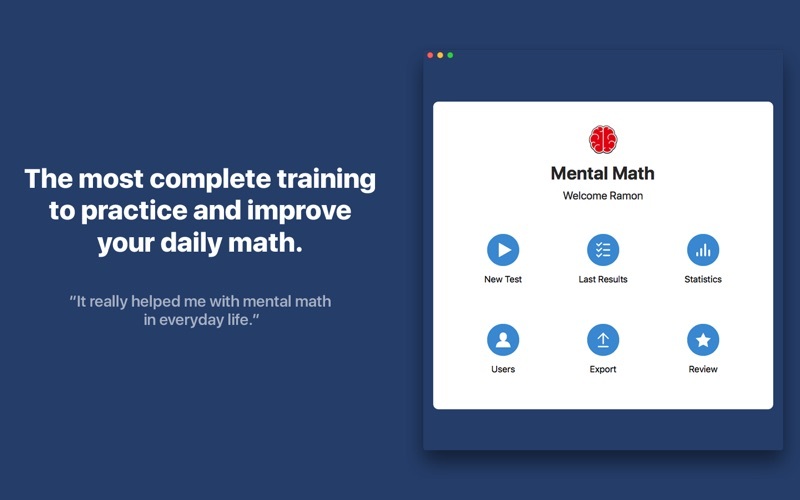 Mental Math is a premium-quality app designed to be your complete math trainer. Download it now and start solving sums faster in your head. Mental Math is also available for iPhone, iPad and iPod touch. The app is now fully localized in English, German and Dutch. I hope you are finding the app useful, challenging and fun. I would love to hear what you think of it. Could you therefore please leave a review on the App Store? It will help me to further enhance the app.